This Craftsman metal register cover is made with a solid white bronze faceplate. Each decorative wall vent is sand cast 1/4" thick and made right in America. Also, each of our metal register covers are made by hand to give you a durable and reliable product. All of our decorative wall vents are equipped with a steel diffuser which will control your air flow. 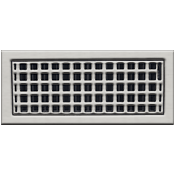 Order your metal register covers according to your duct opening to ensure the vent covers up the hole. These decorative wall vents are made by Classic Grilles and can be used in the floor, wall or ceiling. Metal register covers come with screws for quick wall mounting, but can also come without the screw holes if being used in the floor. Get this decorative wall vent shipped straight to home or job site and pay our standard shipping cost which is one flat rate. 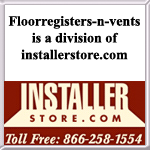 Tip: To purchase the metal register covers, order according to the size of your duct opening and not based off the measurement of an old vent. A 10 x 8 decorative wall vent will fit into an opening measuring 10 x 8 inches. The faceplate will have another 2 inches added to the border to allow for wall mounting or drop in floor installation. Sizing is approximate and can vary since they are handmade. Important: Delivery of the metal register covers can take 7 to 9 weeks after an order has been placed. Once a payment for the decorative wall vent cover has been received, the item is considered non-returnable and cannot be canceled. We offer more metal register covers in Classic Grilles designs for all sorts of styles and home decor. Order a Craftsman decorative wall vent air return which has a screen backing instead of an adjustable damper. Buy these functional metal register covers with us today and replace your outdated ones for a trendier look.